One application of this is found in many facilities that use conveyor wheels. Conveyor wheels are used in grocery stores, factory assembly lines and more. They are convenient because they allow heavy items to be wheeled along a conveyor by hand, giving people the chance to avoid moving these items without assistance. A conveyor wheel is similar to a caster wheel, but instead of a single wheel being attached to a bracket, a series of wheels spin around a metal rod that spans the width of a conveyor. These rods are placed far enough apart that a set of wheels can be mounted all the way across each one. 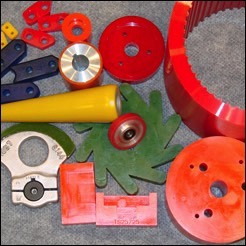 Conveyor wheels are made with different load rating options. If the conveyor will be used in an industrial setting, then chances are that the wheels need to be durable enough to regularly roll heavy materials. If the conveyor is simply being used in a retail setting, like a grocery store checkout, then it is likely that a much lower weight capacity will be acceptable. Conveyor wheels are sometimes manufactured by a specialized polyurethane manufacturer, but usually they are created by a company that builds entire conveyor solutions. The wheels are installed after the conveyor frame has been assembled. 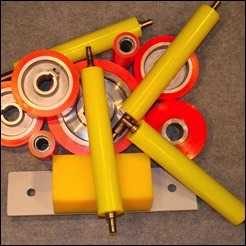 Besides polyurethane, conveyor wheels can also be made from steel, traditional rubber or heavy duty plastic. Most steel wheels are fitted with bearings that go in between the steel to allow for smoother motion during use. When steel is used, it is cut and molded to the shape of the wheel. In some applications, the wheel will be very small in diameter, while more heavy duty applications will require a larger wheel. When rubber, plastic or polyurethane are used; the material is heated and then compressed in a mold. A small metal bushing is then added to the center of the wheel to create a strong central hub for the axle rod to pass through. Conveyor Wheels Polyurethane products are becoming a popular choice in many industries since polyurethane material lasts longer when compared to rubber and plastic, and it is not nearly as noisy as metal.